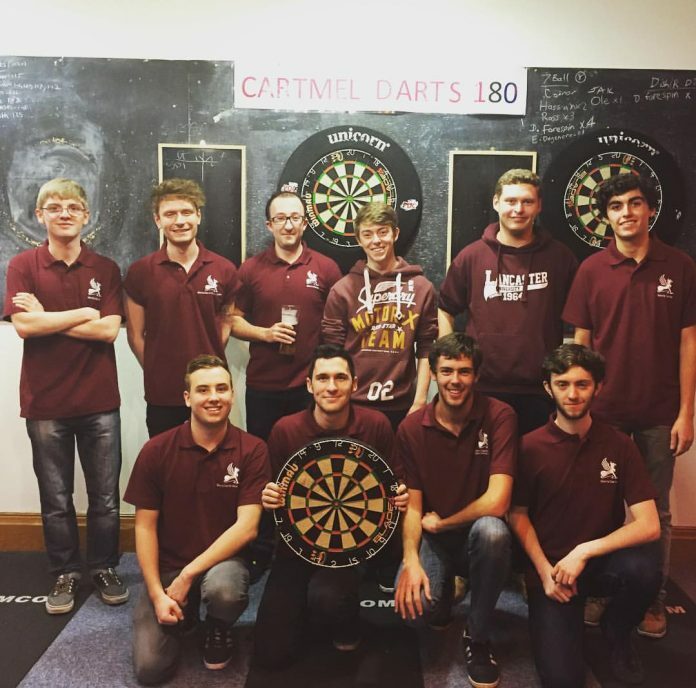 Home Sport Men’s Darts – boom or bust? Don’t worry, I’m not ignoring the Women’s League. I don’t know why they’re even separate leagues anyway. I started writing this article and it got very long, very quickly and I have a word limit. Vol 2 will come soon! Furness are THE team to look out for this year, comfortably securing 1st place. They’re very crafty, not even bothering to update which players have won and lost, so there’s no knowing who the stand out players are. But looking at their performance so far, they’re all decent players, with veteran dartist Nick Dearman being a solid indication of how the game should be played. Pendle taking second place! They’ve got their hands on some incredibly good University players, with James Taylor and Alastair Morrison proving to be the dynamic duo that provide those clutch wins, with the pair winning 11 of their 14 games. But Tom Sharman is the man to watch out for. I played him in WK 12, it was a solid performance from us both but Tom was a different class; checking 126 in the final leg. Treble 19, 19, bullseye. It was incredible, I didn’t even know it had happened; scenes. Grizedale follow in third place, but it’s getting pretty tight in the top 4. They’re always a pleasure to play against, and their team photo is a cute little pic in Dalton Rooms. They’re another sneaky college, not updating the players win/lost ratios, so nobody really has an idea about what’s going on. Captain George ‘Mackerel’ McDermott provides some solid entertainment value at the oche, and I’ve seen him pull off some decent feats. Lonsdale, only one point behind Grizedale in 4th place. They pulled off a big upset against Furness in WK 12, making their intentions for the rest of term known. Andy Smith, James Roberts, and Rhys Warham look to be their MVPs, with a solid 73%-win rate between them. They’re your archetypical dart ‘LADS’, providing some great entertainment, but sometimes at the expense of others. Good darts, bad boys. County occupy the middle of the table in 5th. There’s some erratic results in there that probably don’t reflect just how good the team are, but if they stabilise anything is possible. Captain Ross Pickering spearheads the cause, winning an impressive 7 of his 10 bouts. They came to play at Cartmel on Ross’ birthday, indulged a bit too much beforehand, and one of their players went so red I’m sure he was having a micro-stroke. Fylde follow one point behind County, 6th place. According to their roster they’ve only got 4 people playing for them, and none of them have played any games yet. Lies, Fylde, lies. If they’re not going to make the effort then neither am I. T18, D3 (Luke Wray knows it). Bowland take 7th place! Bowland were genuinely the nicest college we’ve played so far. Maybe a bit too nice, after crumbling against those rowdy Lonsdale boys in an 8-1 thriller. Bar sports veterans Rob Richardson and James Balfour are great players and lovely fellows with impressive records. But Luke Eddleston, or ‘Wristy’, is their clutch player. That man was born with a set of darts in his hand, probably. Cartmel – the quality is dipping as we look into 8th place. But we’re a set of handsome amateurs and we have fun. Our man of the moment is Ross Tetlow, winning 6 of 10. But newbies James Hall and Evan Jones are two stand out players that are blazing their own trail, taking some impressive scalps between them. Captain Toby Wilkinson (Grad Bar) heads the campaign, and has pulled off some upsets in his time. Lent Term is our term, so watch out. Graduate take up 9th and final place. They won their first game of the season in WK10 against Cartmel so who knows where this term could take us? They’re a really nice team to play against, and they have a mysterious player known only as ‘Bob’ who was pretty magical on the board. So there’s the roundup of the Men’s Darts up until now! For the most part, playing bar sports has genuinely made my time at University so much more enjoyable than I’d imagined. Behind all the bluster and bravado it’s all about team spirit, college pride, and friendship. Really lame I know, but it’s true. If you’re thinking of joining your college team, but you’re a bit nervous or think it’s too late, it’s not, just do it. For most of us, it’s about having fun and succeeding or failing together. And if that’s not for you, then it’s something slightly more interesting than “I enjoy reading and spending time with friends”, on your CV.